I’ve been in a rice rut lately. I’ve got long grain, short grain, white, brown. I’m tired of rice. I love quinoa, but unfortunately quinoa is a little out of the budget for the immediate future. So while I was roaming through the grocery store this week, I noticed pearled barley. I’ve used barley once or twice before, but only for mushroom and barley soup. I’ve never really branched out and used it in any other way. Since it’s actually less expensive than white rice, I grabbed some and started mulling some ideas in my head. Right away I’ve noticed that barley is kind of like Rice Plus. Like rice, it has the starchy capability to thicken liquids as it cooks, and it has the added benefit of a more hearty texture. You can really sink your teeth into grains of barley. I like it, and it’s been underused in my kitchen for far too long. I haven’t had any vine ripe tomatoes in a while because the grape tomatoes have been so cheap and so sweet, but the season must be over because they were back up to their normal prices. So I picked up some tomatoes that I could stuff, not sure what I was going to stuff them with. I decided to give it an Italian feel by pairing the barley with some sweet sausage and parmesan cheese. In a frugal step, I used the tomato pulp that I removed before stuffing to prepare the barley and just added a little more chicken stock. It was totally the right call. When I stuff tomatoes, I purposely make too much stuffing. I like to fill the baking dish with the extra stuffing, which allows it to get a little crunchy and contrasts with the texture of the tomato version. The little bit of parmesan cheese helped the crunch factor along. The vibrant red of the tomato on the plate just screamed for a green counterpoint, so I obliged. I paired the stuffed tomatoes with some simple roasted green beans that I tossed in a little lemon vinaigrette. 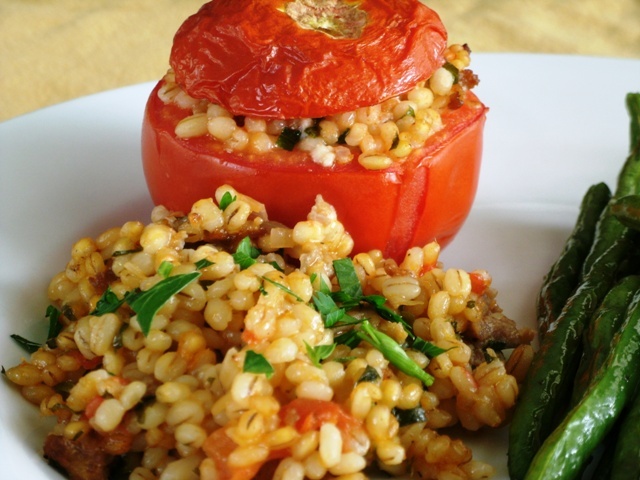 Of course, you can substitute any grain of your choosing instead of the barley for this recipe. But why would you? Really the barley was barely any trouble. Cut tops off of the tomatoes (large enough to use as a cap). Scoop out inside ribs and pulp, reserving for later use. You should have a tomato cup suitable for filling and its cap, both of which will be used. In a medium saucepan over medium heat, sauté shallot and garlic in 1 T olive oil until tender (2-3 minutes). Add enough chicken stock to the reserved tomato pulp to equal two cups. Add tomato pulp/chicken stock mixture and barley to saucepan. Salt and pepper to taste, cover and simmer until barley is al dente, about 15 minutes. In a small skillet over medium high heat, sauté sausage, breaking up with a wooden spoon until browned. In a large mixing bowl, combine barley, sausage, parsley, and parmesan cheese. Check seasonings and adjust as necessary. Salt & pepper the insides of tomatoes, then fill with barley mixture. Be sure to not pack the stuffing tight. Use remaining olive oil to grease 11x7 baking dish. Add extra barley mixture to the bottom of baking dish and spread out evenly. Add stuffed tomatoes to baking dish, nesting down into the stuffing. Replace the tomato caps and drizzle another ¼ C of chicken stock over contents of the baking dish. Roast for 30 minutes, until tomatoes are soft and the skins start to split. This entry was posted in Cooking and tagged dinner, grains. Bookmark the permalink. This looks amazing! Can I make this ahead and put it in the oven to heat through? How long would that take? It will store in the fridge for a couple of days before heating. If it’s cold from the fridge, I’d check it after about 45 minutes (might need a little longer). As long as the tomato skin is starting to split and the center is warmed through, you’re good. If it’s frozen, your guess is as good as mine. Enjoy!